I backed all of the weight-bearing straps with off white drill (so all except the 2 front straps, and 2 of the short straps), to make them extra strong. 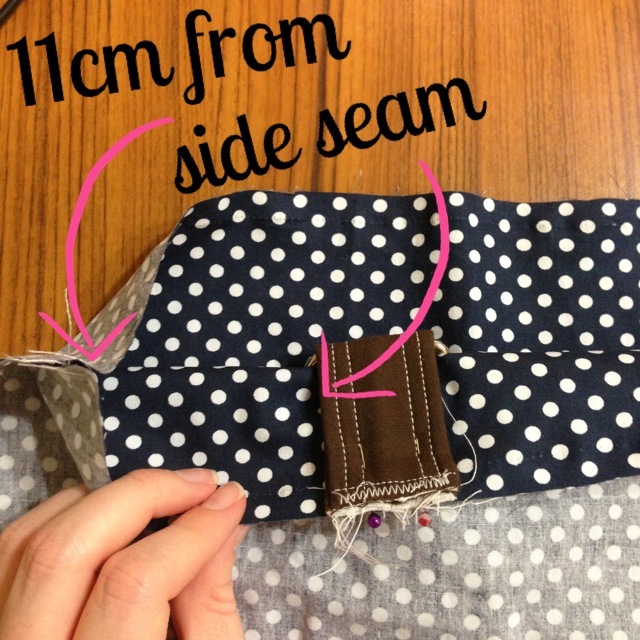 Fold the strap in half, right sides facing, and sew along the raw edge with a 1cm seam allowance, turn right side out. Wriggle the strap so that the seam runs straight down one side. This will become the underside. Press the strap. Run a line of top stitching down each edge of the strap, then use these stitched lines as a guide for the next two lines. Do this to all of the straps. Now to add the hard-wear. Take one of the wire slides and a shoulder strap. With the back seam facing up, thread the strap up between the top fixed bar and the sliding bar. Then fold the strap over the sliding bar, and down between the sliding bar and the bottom fixed bar. Sew the tail end of the strap down, using a box and X design for strength. Now take one of the rectangle rings and a short strap (backed with drill) and fold the strap in half, over the bottom bar with the seam facing. Sew along the raw edge of the strap, going through both sides. Take the raw end of the shoulder strap and feed it through the rectangle ring, over the top bar. Take the raw end and thread it between the bottom fixed bar and the slider bar. Fold it over, and thread it between the slider bar and the top fixed bar, and pull through. 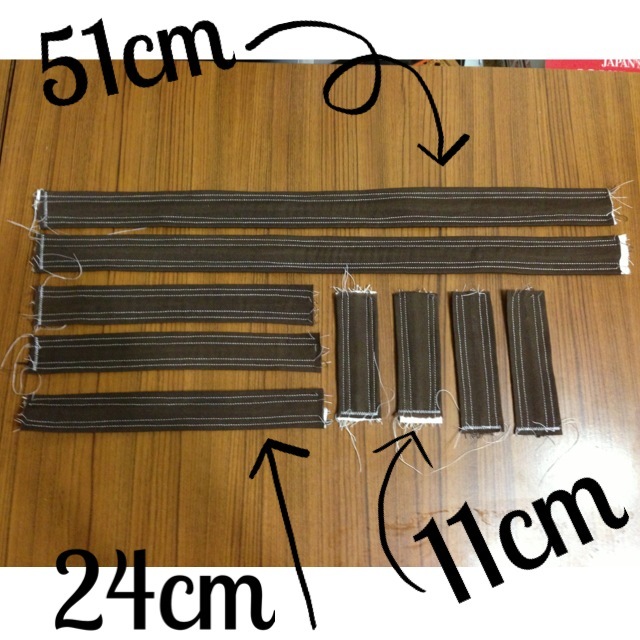 Congratulations, if you can understand my instructions, you have just completed one adjustable strap! 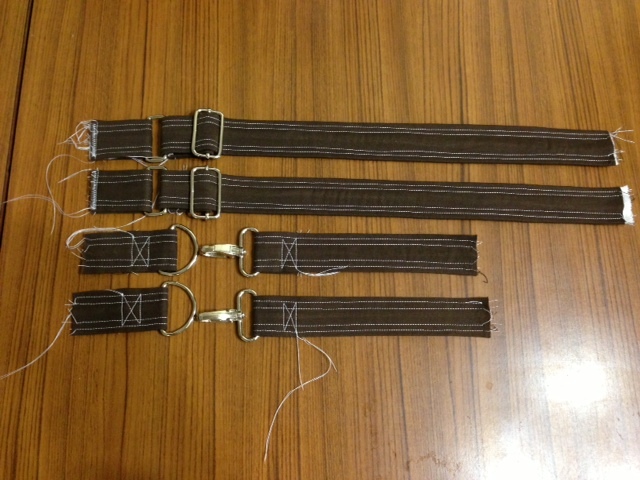 Repeat with the other materials to make the second shoulder strap. Only a few more to go! Take a short strap (shouldn’t be backed with drill) and fold it over the bottom bar of a D-ring, seam facing. Sew the tail end of the strap down, using a box and X design for strength. Take a front strap (shouldn’t be backed with drill) and fold it over the bottom bar of a swivel snap hook, seam facing. Sew the tail end of the strap down, using a box and X design for strength. Repeat with the other materials to make a second set. Please excuse my untrimmed threads! Next, I worked on the lining. I used this amazing tutorial from coldhandswarmheart to insert a zipper, and a cute little pocket into the lining. With the pocket completed, put the back and front pieces of the lining right side together, and stitch down both sides. 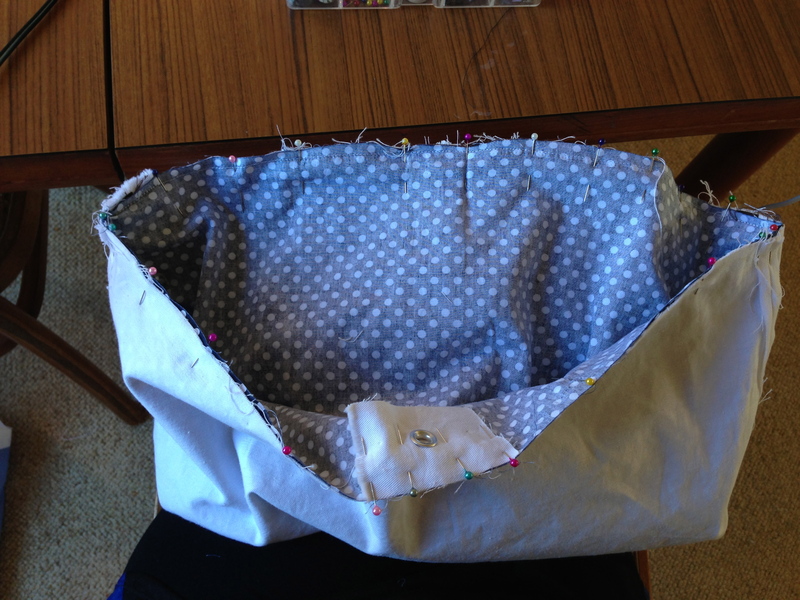 Take the bag base lining, find the middle by folding it in half and giving it a little pinch to make a crease. Do the same along the bottom of the bag lining. Match these little creases, right sides facing, and pin. Seeing as the base is rectangular, you will need to ease the fabric around the base, and trim the corners. 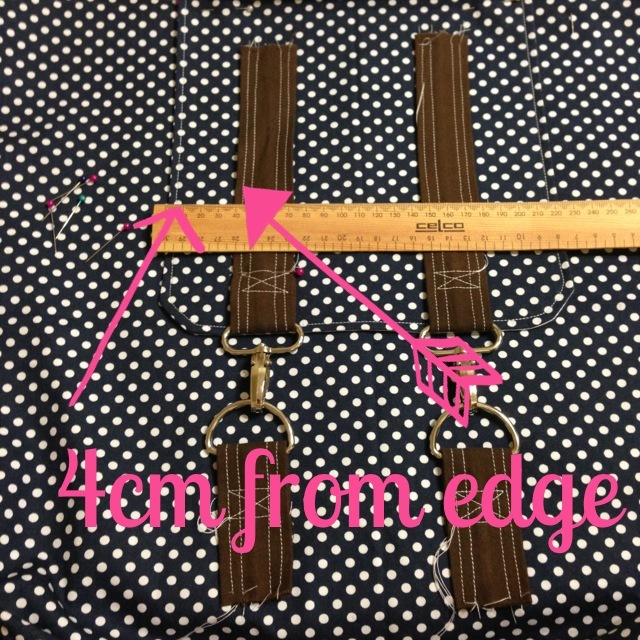 Construct the outer layer of the bag in the same manner, (omitting the zipper and pocket) however, when pinning the base to the front and back, pin the adjustable back straps 11cm away from the side seams, with the back of the strap facing the right side of the back piece. Turn right sides out, and give the seams a press. Pin the polka-dot flap and the flap lining together, right sides facing. Sew 3 sides together along the raw edges, leaving the top edges free (edge without the curved corners). Turn right sides out and press. Run a top stitch around the three edges you have just sewed. Take two front straps with the clips attached and pin them 4cms away from the edge of the flap on either side. Tuck the raw end of the strap underneath itself, and sew the straps to the flap, using the previous top stitching as a guide. Now for the eyelet. 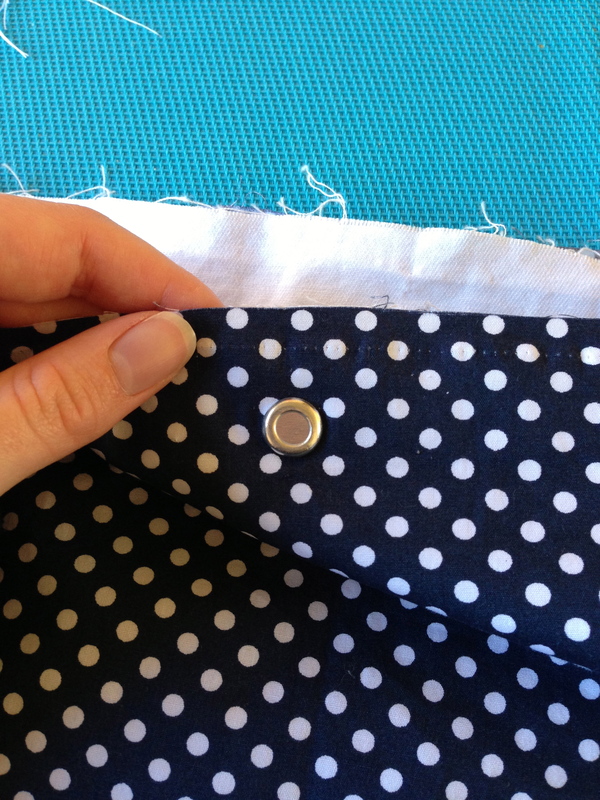 Take the polka-dot front and measure down 2cm from the top raw edge, along the centre line. Follow the instructions on the packaging to insert the eyelet. I reinforced behind the eyelet with a scrap of off white drill. The eyelet I have used is big enough to fit two strands of the cord through. 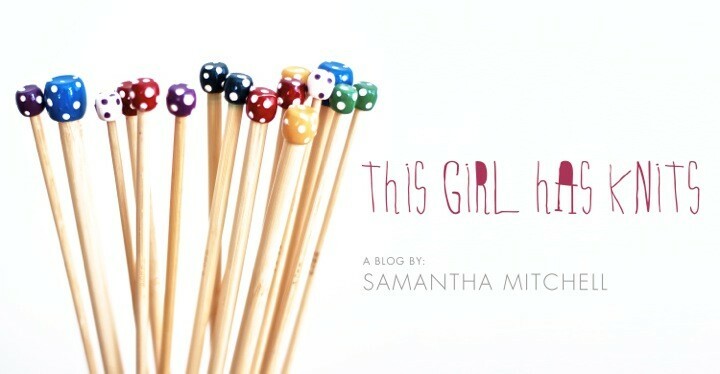 Next you will want to pin all of the back-side outer components to the polka-dot fabric. Start by folding the bag loop in half, matching the raw ends side by side, and pinning them (wrong side facing the right side of the bag… see below picture for my mistake!) next to the middle line, along the top raw edge. 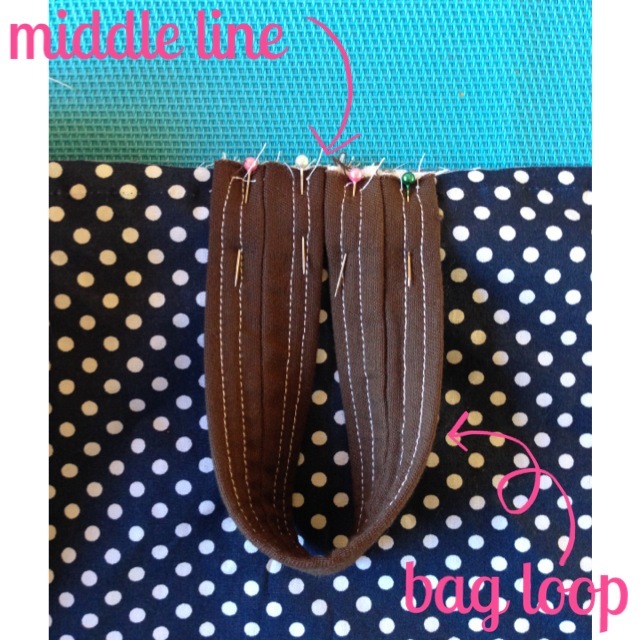 Take the flap and pin this directly over the bag loop, matching the middles, with right sides facing. Pin the adjustable bag straps 2cm away from the side seams, making sure the strap isn’t twisted. Sew along the entire length of the back piece, going through all straps, the flap and the bag loop. I did it the wrong way around! Almost finished! Take the lining and turn it so that the wrong side is facing out. Place the bag with the right side facing out, inside the lining. Pin the raw edges together, and sew around the top of the bag, going through all straps and the flap, leaving an opening about 10cm long. Using this opening, turn the bag inside out. You should have a tube-looking-creation, with the right sides of both fabrics looking at you. Push the lining inside the bag. Run a top stitch around the top of the bag, securing the bag and the lining together (this may be a little tricky around the back straps and the flap, just work carefully). Now run another top stitch 2-2.5cms below the top one. This will make a casing to thread the cord through. Attach a safety pin to one end of the cord, insert it through the eyelet, and push it around the casing and back through the eyelet. Thread both ends of the cord through the spring-clasp and knot both ends individually. Last step!! With the bag laying on a flat surface (making sure the lining on the inside is nice and flat too), fold the flap over to the front of the bag. Attach the clip to the D-ring and line the strap up with the strap attached to the flap. Pin in place to the front of the bag, going through one layer of lining. 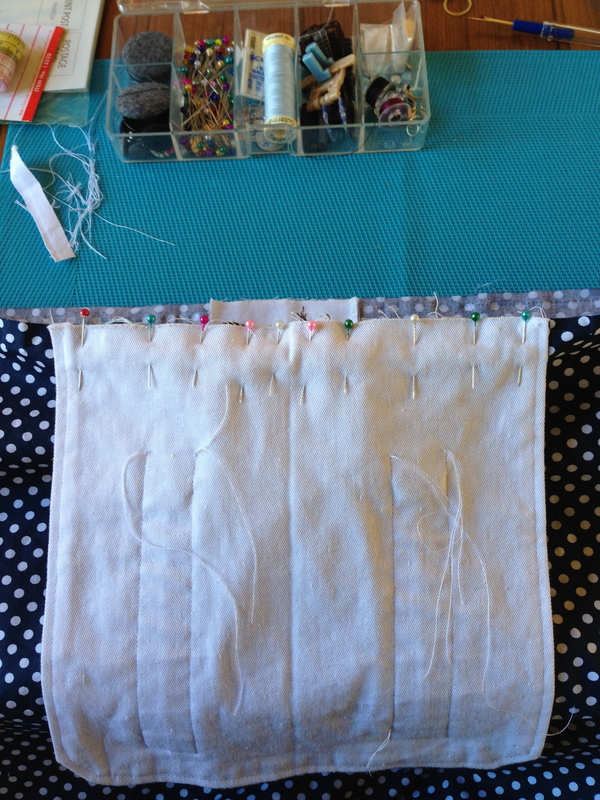 Sew the strap to the bag (yes, going through the lining as well), using the previous stitching as a guide. Trim all the thread ends that you may have sticking out… and you’re done! WOW! Are you as excited as I am? Is your bag as amazing as you expected? I hope that this tutorial is of some help to you, and I really hope that you don’t find it too impossible to follow. My advise is to read as many tutorials as you can to really get an understanding of the steps and components of a backpack. As always, if you have any questions, please don’t hesitate to ask! This entry was posted in sewing and tagged backpack, craft, DIY, Pattern, rucksack, sew, Sewing, Textile, tutorial on July 23, 2013 by this girl has knits. wow cool! thanks for the tutorial, looks awesome! 🙂 No problem at all! Glad you liked it!